If you own a car, it probably makes noises you can't identify, but would love to fix. Car noises are not just annoying: sometimes they are a warning sign, like the calm before a storm. Here are the four car noises customers most commonly complain about. Sometimes noises are hard to identify, because a noise travels throughout the vehicle and it is hard to pinpoint where it's coming from. But with a trained ear and some insight, we should be able to figure out what is causing the noise in your car and what you can do to fix it. The only way to fix this condition is to replace either the whole axle assembly or the outer CV joint. 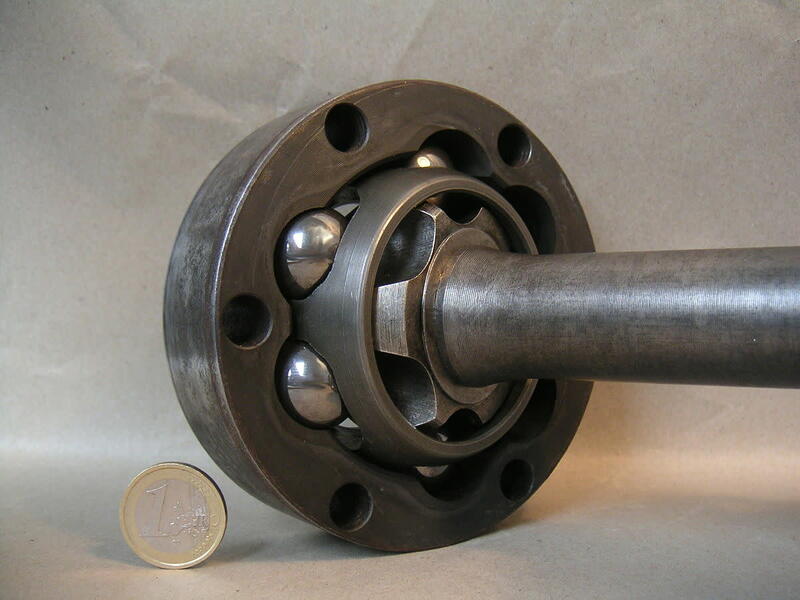 My professional opinion is that it’s better to replace the entire axle assembly; it’s usually cheaper, even if you can even find the outer joint sold by itself, and it doesn't make much sense to mix old parts with new parts. Water pump noises are very difficult to diagnose, because the water pump is generally buried deep in the motor, and the noise will resonate through the engine making it difficult to identify. The water pump on your engine is a thick metal casting containing a pulley, pump fins (a palm-sized propeller to push the water along), and a bearing set. When a water pump fails, the noise is usually caused by damage to the bearings. The video below is a great example of what a noisy water pump sounds like. The only fix for a noisy water pump is to replace it. Because of its location (often under the timing belt cover and bolted to the engine block), an awful lot of parts have to be removed to get to it, so it can take several hundred dollars worth of labor to replace a $50 part. 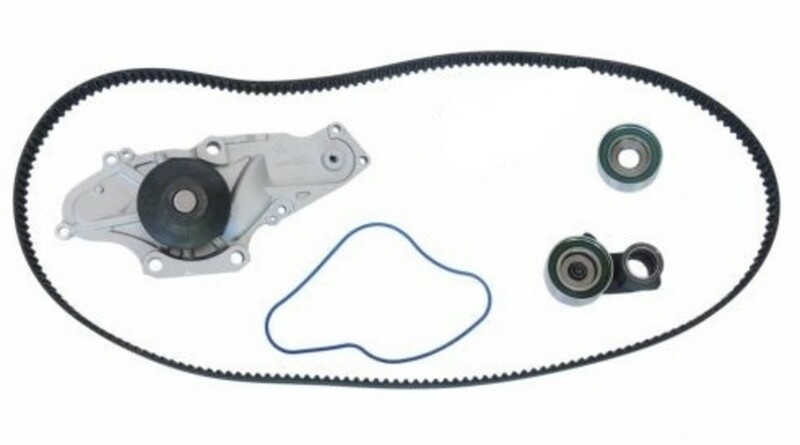 If it is nearly time for a routine timing belt replacement (every 60,000 to 105,000 miles or so depending on the car), you might want to have that done at the same time as the water pump, because timing belt service is one of the rare occasions when a water pump is easy to get to. In fact dealerships will often want to replace your water pump routinely, whether it’s worn out or not, as part of a timing belt service. In the video below, the mechanic uses a screwdriver like a stethoscope, pressing it against the hub of a wheel to listen to a wheel bearing noise. Some folks like to use a spray called “belt dressing” to stop the engine belt squeal or squeak. Keep in mind that this spray will not fix anything permanently. It is, however, a great tool for diagnosing the noise and finding out which belt the noise is coming from. If you have belt dressing, this is what you do: when the engine is running, just spray it on each belt to see which belt starts to quiet down. Inspect your engine belts for cracks, damage, and tension, and replace or adjust them as needed. A heat shield noise is a type of rattle you hear while your car is idling, or at a specific engine speed or RPM. Heat shields are metal plates along the exhaust system of your car that deflect heat away from the floor of your vehicle and other heat-sensitive components like fuel tanks, wiring, and brake lines. As the exhaust system ages, sometime the heat shields start to rust at the hold-down points and become loose. 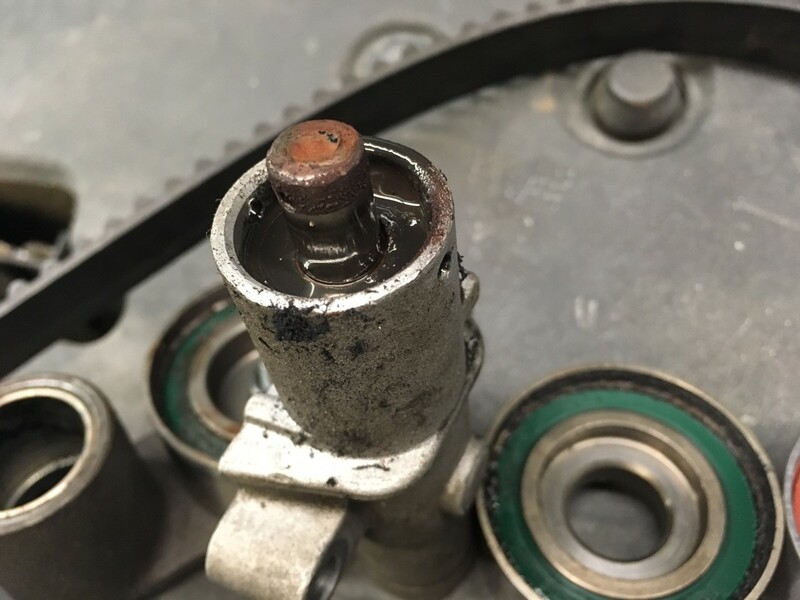 If this is your problem, the engine vibrations will cause an awful noise as you’re sitting at a stop light or as your car is idling in the driveway warming up. It sounds like rocks being shaken on a cookie sheet. Heat shields can become damaged due to road debris, snow banks, automotive lifts, and just plain old age. In some cases, a damaged heat shield can be removed temporarily without causing any repercussions, but it's best to replace them as soon as possible. An automotive exhaust system can become extremely hot, even 1000o Fahrenheit if you are running your engine at high RPM for long periods, like on the highway. Here's a little tip that not too many people know about. When buying a new car, if possible, find out what day it came off the assembly line. Watch out for cars built the day before a holiday, or on a Friday afternoon. It may sound funny, but humans are building these vehicles, and you know what happens at 5 o'clock on Friday or at closing time the day before a holiday: we rush our work so we can head home to relax or prepare for the holiday. This is not a fact I found in a documentary or anything, it's just my experience. When our shop saw new cars with a lot of little problems, it seemed like they were always built on these out-the-door days. If you have a noise in your car and you can't seem to figure it out, ask me about it in the comment box below and I will answer your question as soon as possible. Diagnosing a Wheel Bearing Noise. Your mechanic says you need a wheel bearing. What's a wheel bearing? Pictures, video, and my own interpretation of what a wheel bearing is, what its job is, where it's located, and the noises it makes. Steering Wheel Vibration: My Car Shakes While I’m Driving. If your steering wheel vibrates, or your car shakes while driving at highway speed, find out why. Don't spend money unnecessarily on an alignment or other services that won't fix this problem. My Honda Accord makes a rattling sound when I come to a stop and when slowly driving away. Sounds like it's coming from under the front of my car. What can it be? I am hearing a faint whining noise when my car is stopped. I don't hear the sound as I am coming to a stop; I only hear it when fully stopped with my foot on the brake. Once I take my foot off the brake and accelerate, it goes away. What could be causing it? I recommend checking the power steering fluid level; it sounds like it may be low. I have a 04 Impala LS 3.8lt auto, it has developed front end noise on the passenger side, only when turning right. It sounds like a metal clattering noise to me. Turning the s-wheel to right while driving or bumping the s-wheel to right, bing bing bing, like broken spokes hitting metal, is my best guess to describe the sound. Replaced front struts, cv axles, motor mounts, but still have the same noise. Do you have any advice? Are you sure this noise is not coming from the brake area? 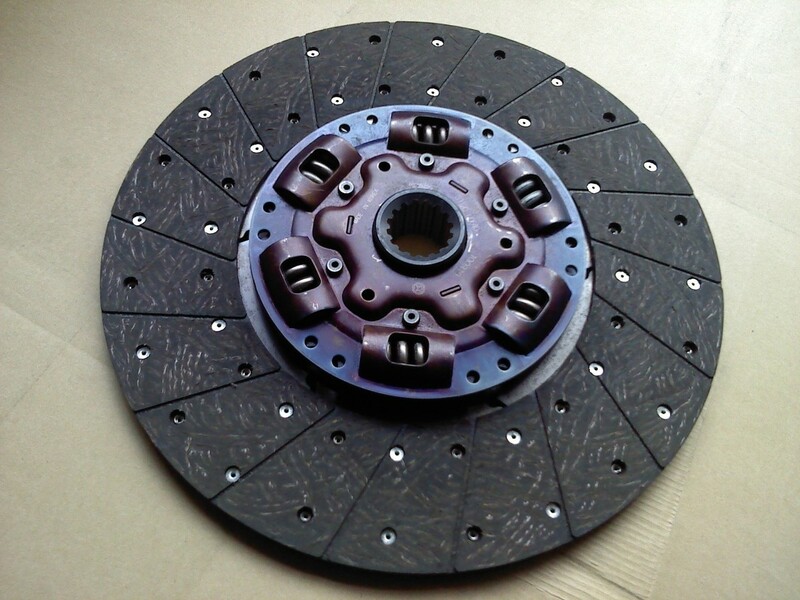 It is possible your rotor backing plate is touching the rotor or maybe there is a rock stuck between the backing plate and rotor. I have a 97 Jeep Cherokee. it sounded like a tailpipe dragging. Looked under and saw nothing. Started back up, the sound was gone. Drove a few miles and it started back again. Stopped for a minute and it was gone again. It's parked at home now. Can you help? I just got a 2015 Toyota Camry. It idles quietly, and can drive under 45 mph. I don't hear any sounds until I take it close to 50 mph and let off the gas pedal, in which case I will hear a knocking sound. The sound will cease when I slow down, and I won't hear it until I go around 50 mph again. There are no warning lights on the car, nor is there a noise until I get over 50 mph. What is happening, and what should I do? It sounds like maybe a CV joint. You should have a 5/50 powertrain warranty, so call the dealer and ask. My jeep patriot is making a low noise around 30mph. It almost sounds like the noise a ceiling fan makes. It doesn't do it while I'm sitting at a light or when I'm going any faster than 30 mph. Any Ideas? Possible wheel bearing or tire noise? Check the tire wear first, make sure it's even. My Toyota Corolla 2015 is making a soft thumping and soft banging noise. It sounds like it's coming from one of the tires. What could it be? If you hear the noise when braking it's possible the rotors have pad impressions caused by rust. If the noise is heard while driving without applying the brakes, it's possible your tires are worn or uneven and are causing the noise. My 2012 Jeep Grand Cherokee makes a weird whining noise when sitting in traffic with my foot on the brake. If I put it in park, it only seems to do it when the vehicle is warmed up. It also made the noise when I was backing into my carport when turning the steering wheel. The noise only lasts for a few seconds then goes away and is fine when driving any ideas? I recommend checking the power steering fluid reservoir; it sounds like you may be low on fluid. If so, have the steering system checked for leaks. My car just started making a noise like drums in the area under the dash. I have a Pontiac Vibe. Any idea what it might be? If you only hear it when the fan is on, you could have some debris stuck in the blower motor. My 2016 Ford Edge makes a single clunking/clicking low pitched dumb short noise when moderate to hard braking is applied, right before or almost when the vehicle is coming to a complete stop. What could this be? I'm not sure there is such a thing as pad shift, but this only happens the first time you hit the brakes moving in a forward or backward direction and you only hear it once when moving in the same direction, you will only hear it again when going in the opposite direction and hitting the brakes once. My car starts rattling when accelerating uphill, but taking off from idle blows a grey smoke. What could be the issue? It sounds like you're describing a ping noise from the engine, and you're burning oil. You should have the ignition timing checked. My 2004 Hyundai Sonata has been making a weird thudding noise. It seems to come from my right rear tire. It only happens when I seem to hit a rough spot on the road, and goes away when I slow down. Any ideas of what it could be? I recommend having the shocks/struts checked, it's possible one is leaking and causing the noise. Why does my Honda Odyssey front end make an occasional moaning sound at low speeds? Why does my 2009 Chevy Traverse make a rattling noise when stopped at a light? It seems to be coming from the middle console. If the noise is coming from under the car, check the exhaust heat shields, sometimes they become rusted and loose, then start to rattle at idle. After turning the engine off of my 2014 Avalon, I can hear a clicking noise coming from the rear part of the car. What do you think it is? It's either your exhaust pipes cooling down or the fuel tank expanding and contracting. My car is a 2003 equinox. Everytime I come to a complete stop it makes a clunk noise. What does that mean? It's possible you have a worn or loose suspension component. I recommend having it inspected to locate the noisy component. My 181 Golf diesel engine continues to run after the engine is switched off, do you know why? Have the engine timing checked, that would be the most common reason for this to happen. I have a loud vibration/rattle coming from my car; it does this as I’m accelerating and also at idle, but obviously goes away if I rev the car. My exhaust is solid, and I have no lights on my dash so concerned as to what it could be and how to fix this? Exhaust heat shields can appear to be solid, but when examined closely you may find a corner near the stay rusted and completely disconnected. I recommend having a mechanic place the car on a lift and take a look underneath. When the engine of my Fiat Punto is hot and running at 2000 rpm, it sounds like a rattle or some kind of rumble coming from the top of the engine. What could this be? It only does it when the car is hot. It could be that the oil level is too low, or that it is in need of an oil change. My 2002 Sebring is making a knocking and squeaking noise on the passenger rear side. At first, I thought something was rattling around in the trunk, so I emptied it. But it's still there and getting worse every day. It is mostly during in-town driving; when I get on the interstate, it seems to lessen. What could it be? Is it safe to drive? I recommend checking your shocks first. One could be blown out and causing this type of noise. If they are not leaking, check to make sure both top and bottom of each shock is tight. Try bouncing the car in the driveway to see if you can reproduce the noise, and have a partner see if they can locate the noise if it can be replicated while bouncing the car. I hear a high pitched whistling noise coming from my front left tire and under my truck. I have a 05 Silverado 2500HD. It does it both driving and idling. What could it be? It could be a vacuum leak of some sort. You'll need to pinpoint the location of the noise and see if you have any disconnected or broken vacuum lines. My car was making a whining noise, but it has stopped. What could it have been? I recommend checking your power steering fluid level. I was just turning into my complex when I heard a low scraping noise from the rear right side of my vehicle. Do you know what this may be? Check out my video on this type of noise, this may help: https://youtu.be/HR8UbHpBfmU. How can I correct rear wheel noise on a Honda CR-V ? I think what you are hearing is a loud rubbing noise on tight turns. If this is true, you need to replace the rear differential fluid with genuine Honda differential fluid for your year make and model. Sometimes we need to drive the vehicle for a week then change the fluid a second time. My 2011 Mitsubishi Galant is making a whining sound on the passenger side front end. What could this be? If the whining sound is heard above 25mph and gets louder with speed, it possible that you're hearing either a wheel bearing starting to fail, or the tread is starting to wear uneven. I recommend checking the tire tread first, and if everything looks OK, have the wheel bearings checked. I have a 92 Jeep Wrangler with a manual transmission. Lately, it has been riding very hard. It feels like its pulling from the back, I think. It drives super slow when I’m between about 15mph to 40 mph. After 40 mph, it resumes driving smoothly; well as smoothly as you might expect of a jeep. Do you have any ideas? It sounds like your engine is lacking power. Spark plug wires can have that effect on an engine, it will sputter and choke until you get up to speed and will smooth out when coasting, but as soon as you put a load on the engine, it will do it again. Check your wires first. My 2013 G37x started making a low humming noise that sounded like it was coming from the left rear wheel. It starts when I get to about 40 mph and I can only hear it when the back rear window is open. The car only has 26k miles on it. What might it be? If you hear it with the window open, most likely it uneven tire wear. I have a 2006 Chevy Aveo and my car is making a noise that I can't explain. My daughter says that it sounds like a belt. The noise mostly sounds like it's coming from the right side of my car.Can you give me an idea what it might be. Can you describe the noise? Is it a grinding noise, an exhaust noise, rumbling, scraping, dragging, etc? Do you only hear it when moving or can you hear it when revving the engine with the trans in neutral? I have 2000 E430 4matic sounds come from underneath the vehicle only when parked and its idling not when accelerate. rattle noise when slowing down and coming to stop...approximately 30 MPH and lower...is it a loose heat shield maybe? My car makes a sound when in drive that sounds like something is unbalanced. The sound was happening before i replaced the brake calipers, pads, rotors as well as had all the tires replaced because of a pothole.. I tis like metal rubbing but only when the car is moving forward. My truck wont start . It continues to make noise when the keys are not even in the ignition, almost if something is stuck on. Do you know what this might be ? My 2013 Toyota Corolla le is making a horrible rumbling sound when I start it. It stays doin that when in park and neutral. When in reverse it makes the noise it normally would but in any shift under neutral it's completely silent. Can you help please? Put in oil and transmission fluid and didn't help. My opel astra h 1.6 2008 model is making rattling noise coming from the engine like a chain is loose or something is loose inside and the engine light came on. Its now loosig power on take off and it sounds like old disel car yet its petrol. I also noticed that the radiator fan runs forever as if the car is overheating with no warning. You're going to have to speak to the manager of the garage and tell them you've already spent a ton of money to fix the noise and it's not fixed, so either they reimburse you your money or fix the car at no charge, they need to be held accountable, so if it's not fixed, they need to do something to fix it. Let me know what happens or if you need more advice. If the noise is no longer there and the car drives normal you shouldn't worry. My 2003 Altima will thunk once a few seconds after ignition. The sound is very loud and it sounds like it’s coming from overhead. It’s always a single thunk that doesn’t continue while driving. I need some direction, please. 2013 Chevy Traverse, started making clunking/knocking noises (2-3 at a time, not constant) at front right when turn left or driving over bumps for the past 5 months. I have taken it to the local garage 3 times- first time they couldn't hear it, second time they replaced the front sway bar bushings, third time they said the axle had movement in it and replaced it. The sound is still there! I know nothing about auto mechanics and am becoming a bit frustrated...any suggestions on how I should handle this with the garage? Thank you. I have an eight year old mitsubishi challenger and lately I've been noticing a rattling sound whenever the engine get warm. The sound only shows up when the engine gets warm after a few minutes of driving at slow speeds. Any idea where this could be coming from? I recommend having the front CV joints checked. Worn CV joints will make a clicking noise on acceleration, and even more pronounced when turning and accelerating. Let me know what you find out, thanks. It could be a wheel bearing noise. If you start to hear the noise around 25 mph and gets louder with speed I recommend you have the wheel bearings checked out. Let me know if you have more questions, thanks. Hi, I have xpander gls automatic trasnmission, and its making noise when lm driving, its like an echo sound just like microphone’s echo ..I wore my seatbelt and checked the hndbreak, it was all ok and there was no warning sign in the dashboard? What could be the problem? hi, i have a Nissan Note 2010, it makes a cracking sound when accelerating, the moment you release your foot on the accelerator it stops. also struggles a bit in accelerating after passing a bump. It sounds like your catalytic converter is clogged or your exhaust has a restriction and exhaust is leaking (blowing) out one of the gaskets or weak points. A clogged catalytic converter will also cause a loss of power. Keep me posted on what you find, thanks. Hey Eddie, I have an 05 Altima it’s making a blowing noise when accelerate but it loses power when I accelerate as well. What can the problem? If you feel something is wrong, you're most likely right. So what you're saying is the car doesn't need to be moving to hear the noise? I had a car the other day who's exhaust system was push against the floor from going over a snow bank and would make the whole car shake at idle. Wheel bearings will only make noise when the car is moving so I would take a close look at the exhaust system and hangers, motor mounts and transmission mounts. Let me know if you have more questions. My Altima makes a humming sound when in drive and especially when accelerating. The floorboard feels like it’s vibrating while in drive as well. I’ve had the bearings checked, and I’ve had it looked at three times in the past month and a half and nothing has been found majorly wrong..but the sound just won’t go away. Are the mechanics missing something ? It's possible the alternator is making a high pitched noise, it pretty common or maybe even the serpentine belt? It sounds like your brake pad wear indicator is touching the rotor warning you the brake pads are getting low. I recommend having a thorough brake inspection done on the vehicle. My 1995 ES300 Lexus (280,000 miles) good car is making a whistling noise when I first turn the car on (it starts right away) and whistles and continues intermittently as I drive. There is no engine light on-could it still be connected to a vacuum hose or line? There is a noise when I sometimes put my foot on the gas. What does that mean? Hi Lisa, If it's making noise when turning an accelerating from a stop, the most likely problem is an outer CV joint. It's possible one of the CV joint boot is torn and it has lost some grease. I recommend checking each outer CV boot for any damage to start. Keep me posted on what you find, thanks. I recommend having the tires checked first, it sounds like you may have uneven tire wear. Let me know what you find, thanks. Hi - I hit black ice and the left side of my 2016 Jeep renegade wound up in a snow bank. That was over a week ago. My Jeep seems louder when accelerating (no noise at idle) and like a droning/plane landing sound when I slow down (not brake, just lifting off the accelerator). It seemed fine after I hit the snow bank (no exterior damage) but could I have “broken” something underneath? Thanks!! I have a 2010 Nissan Altima that has been making a rattling/vibration sound when driving but as soon as I brake it stops. I’ve taken it to two shops and both didn’t find anything majorly wrong with it and just sent me on my way. If it’s so minor what the heck is so noisy? Can a loose heat shield cause vibration feeling during drive? I have a 2019 Toyota Avalon Limited with 2500 miles. Recently we have been noticing an intermittent low frequency fluttering noise above 50-60 mph. It occurs on all types of road surfaces and with differing wind conditions. It almost sounds like we have picked up a piece of cardboard that is catching the wind. My first thought was that a splash shield was loose somewhere. I took it into the service department at the dealer. They checked and found nothing. After a few weeks more I took it in again and had the service manager ride with me to have him hear it. He said it was probably the low profile tires. I could possibly believe this if it was constant. But no, it is only intermittent. Any thoughts? Does the noise change at all when braking or turning? Is the noise still there? Sorry so late with my reply. We just bought a 2019 Honda HR-V. Took it to the dealership because we had a rattling noise coming from the exhaust system. They told us the cars after 2016 have a new exhaust system and so when the car is cold, the catalytic converter needs to get warm. When it's cold the set up opens up and thats why we hear the rattling noise. When the car is warm, the noise should quiet down. We have a video and it was cold that night. The rattling noise was loud. Today, they said no loud noise was heard when the car was on the lift. When we got the car back, the noise was significantly quieter. They said it was nothing to worry about and that no holes were seen as one of our friends had suggested. So, we left believing all is well. Is this all true? I just want to be sure. 2001 BMW. Was at cruising speed on flat highway, then high pitch and now clunking sound from left rear. thoughts? Not even sure where to start. Is this a new car for you? Have you owned it for a while? Is the noise one whooshing noise or is it constant until you slow down? What does the rattle sound like, is it metal, plastic, or rubber sound? Is the noise constant or intermittent? Do you hear it at idle, while driving or both? My 2006 Lexus IS has been making a rattling sound when idling, more so during start up. Suspecting my oil was low, I drained the oil and replaced the oil filter. The sound is somewhat quieter, but still noticeable and appears to be coming from near the coolant reservoir. I haven't had leaking coolant, overheating or steaming so I'm not sure whether it could be the water pump. Any advice would be great thanks. The first thing you should have checked is the exhaust heat shields, it's a good possibility that they are loose and either need to be reattached or removed. Let me know what you find, thanks. Hello! I don't know much about Jeeps, but I have a 97 Jeep Grand Cherokee 4×4 so it is always 4wd, and when it starts, it makes a light click noise that seems to kind of rattle when the Jeep is in park, and every now and then when I shut the engine off, it will make an even louder clunk noise. The clicking noise on turns is most likely a CV joint or U-joint, the ticking at idle is internal engine noise possible cam or lifter noise and will have to diagnosed by a mechanic. Hope this helps a little. Not really the vehicle to be mudding in lol. Sounds like you may have broken an axle, let me know what you find, thanks. Hi Mike, I recommend checking the engine belt tension and condition to start. If the belt is loose or dried and cracked, replace it or tighten it. My 2009 Toyota altis have a loud screeching sound from engine whenever I lift my feet off accelerator..when slowing down or parked. The moment I step on accelerator the sound gone. The noises you're hearing are normal, as long as you don't hear any clicking when turning and accelerating and no vibration under hard acceleration the axles should be ok. I don't have a good answer for you. The clicking noise may have been a CV joint noise but this wouldn't cause any issues as far as tire wear goes. I’ve got 2008 Chevy impala that I recently bought from a mechanic but as I was driving out of his garage with it while in reverse and turning the wheel all the way to the right I heard multiple clicking noises coming from what sounded like the passenger side front tire and he said that it was normal now 2 months later my tires in which he said were brand new are now complete shot in the front one blew and right after when getting on the freeway I heard knocking which sounded like it was coming from the glove box the other tire has metal comin out of it and the two back tires still look brand new but when I brought it in to get an alignment they said they couldn’t do it because something is Bent under there somewhere they didn’t know what it was also the day I bought it I was sent to another mechanic to replace a tire sensor that was bad and i guess the guy didn’t even replace it and Now it’s back at the mechanics that sold it to me so they can find the problem, the thing is he’s saying I must’ve hit something and I know I didn’t and so I’m wondering if the clicking noise that wasn’t fixed and the sensor that was never replaced if that could be the cause of these problems? Please help? I have a 2014 Honda Accord sedan with 35,000 miles, a month or two ago it started making flapping noise in the front. It sounds like a panel or shield is loose. There is no vibration. It is most noticable when above 40 mph but it doesn't change with a change in speed. Could it be a problem with the tires? My dealer just rotated the tires and that had no affect on the noise. 2010 Acura V6 TSX, replaced passenger side wheel bearing, and both passenger and drivers side CV Axles. I notice going into reverse I get a slight clunk. Checked both front and rear motor mounts seem ok! When the car is in park, I rock the car back and forth and notice a clicking noise, on the drivers side in the location of the differential and drivers side axle where it goes into the differential! How much movement should I get in park, could this be the inner joint of the new axle! Could it be a taper bearing in the differential. Both axles are aftermarket new not remanufactured. Thanks in advance for your input! Do you know if the noise is inside or outside the vehicle? Is the vehicle still under factory warranty? Could you take a video of the noise and send it to me? Did you check your exhaust for any loose heat shields or maybe a rattle inside the exhaust system, maybe like a double lined pipe that has become separated? I recommend checking your power steering fluid level, top it off if its low. If the fluid level is ok, have your engine belt checked for signs of wear and if the belt is loose. 2005 Chevy Malibu when started today made a whining type noise coming from engine. I continued to drive it and it stopped as I drove, but the noise came back every time I would slow down or stop completely. What's going on?? 2000 mustang gt rattling metal sound while moderate acceleration and fully warmed up. Gets worse the warmer motor gets. Nothing revving out of gear and nothing wirh serp. belt off. Hi Eddie, I have a 2007 Nissan Xterra that has been making a faint noise only when I accelaterate (any speed -whenever my foot is on the gas pedal). No one else has been able to hear it. The mechanic has done a few things most recently replacing the serpentine belt but I continue to hear the noise.The best way I can describe the sound is when your tires are spinning in ice. It's like a small motor being stressed. Appreciate any thoughts- thank you!! Sounds like you may have a wheel bearing starting to fail. Hi, I have a 2015 Ford Escape SE. This morning, I turned my car on, put the heat on max and went to brush the snow and ice off my car. When I returned into my car I noticed that the heat was very loud. It sounded similar to that of someone blowing a blade of grass between their lips, except a lot louder. I also noticed it seemed like my whole car was vibrating pretty intense. While driving it down the road I turned off the air, and everything went quiet, and stopped making noise. When I turned the heat on again, it started the noise and vibrations instantly. I tried turning the heat down to a normal driving tempature, and it still made the noise. Any ideas as to what it could be? (I'm leaving on a month long road trip in 2 weeks, and thought I just finished doing all that was needed; 2 front wheel bearings, all new tires, oil change, and replaced front right lower ball joint). I recommend having the sway bar links and bushing checked for looseness and play, that is a very common rattle on odysseys. A heat shield is usually either attached to the exhaust system or mounted around the exhaust system, that's all a heat shield does is reflect heat away from combustable material or parts that should get hot, it shields parts from the heat. Your mechanic may have removed the under engine splash shield to perform an oil change, and yes they may have left something loose. I recommend bringing it back to that mechanic so they can check their workmanship, something could be dragging. 2012 Ford focus. Hollow metal thumping from right front or across front seat area (under the car). The sound does not get much louder but more of it or faster when accelerating. It seems to be less or not at all when the weather is cold. It seems to happen between 35-45 mph. Nothing changes with turning or veering. First, replaced bent rim of left front tire. Sound persisted. Second, rotated tires to back. Sound changed but is still there. Third, diagnosed with transmission problems (known issue with this car and Ford) dealership replaced module, clutches, reprogrammed, etc. The car drives much better but the noise is still there. After listening to the vid on brakes and rotor pans.? it almost sounds like that but not as tinny or sharp and not at all scraping. My 2004 Honda Odyssey rattles on the driver side only when I'm on gravel not on pavement and has started to make it like I can feel a vibration to my foot on the gas pedal when I accelerate and it kind of feels like something's holding it back . I have a 2005 Mercury sable, and it makes a hissing air noise when driving it. It's possible either the water pump or alternator bearing is starting to fail but you'll need to get it diagnosed to be sure. I have a 2007 Toyota Rav 4 with 115000 miles on it - no trouble with it, but the other day when I started the engine, I notice a soft howl (not loud or high pitched) only at low RPM (800 to 1500) tough it does increase in volume as the RPM's increase - then after the RPM's get to about 2000 the sound goes away. After a while it when away after a few miles - it stopped. Today, when I started the engine, it was there again. All the oil levels are fine. I cannot hear specifically where it is coming from. Could it be a belt wearing out? As it warmed up it started squealing- High pitches but not as loud as belt noise. It’s had new pads. It’s done 144,000 miles and at 139,000 it was drained because previous owner overfilled it with oil by 1.5 litres. All oil was removed but bit of smoke still from exhaust as it warms up too. The squealing didn’t start till warmed up a bit. It has been sitting for six months in garage. my stabilitrak service and indicator lights come on when I make some sharp turns of my steering wheel??? It's possible one of your inner CV joints has a problem. I recommend having both checked out for leaks and looseness. My car doesnt shake or nothing. But when i drive over 20 miles per hour. The car makes a knocking almost like a popping noise. N it gets louder as u pick up speed. First thought was wheel bearing. But its nkt when im turning. Its making the noise even driving straight. What do u think it is? Where was the smoke coming from, under the hood? It sounds like you're describing a CV joint noise on sharp turns and when accelerating. I recommend having the front outer CV joints checked for play and leaks. I'm not sure what noise you're taking about by your description. What type of noise do you hear? Is it a tapping, growling, humming, rapping, flutter, whistle, chirping, rubbing, etc...?